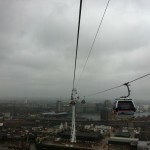 We decided to take the Emirates Air Line from the south side of the Thames to the north, leaving from Greenwich Peninsula station – which is located just a short walk from the O2 Arena (re-named North Greenwich Arena for the Olympic and Paralympic Games). It was late afternoon on a weekday and fairly quiet, so there wasn’t a queue. I suspect that’s not the case at the weekends and certainly won’t be during the Olympic Games, but the cars arrive and depart with surprising frequency and apparently carry up to 2,500 people each way per hour, equivalent to 30 double decker buses. We passed through the ticket barriers using pre-paid Oyster cards, just like any other Transport for London service, and took the lift to the platform level. A steward (they are all dressed in Emirates corporate colours like airline staff) directed us into a vacant car as it cruised along the platform. The car would easily have held several people, but we were fortunate enough to have it all to ourselves on this occasion. 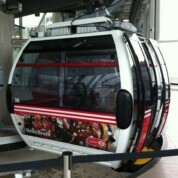 There was easily room for the buggy, and access from the platform into the cable cars is step-free. The journey itself passed more quickly than I expected. Once you get over the fact that: (1) you are dangling from a cable at a great height above the Thames; and (2) there’s a slight rocking sensation (unless I was just imagining that); there’s barely time to take in the view before you’ve completed the 1.1km distance. Due to poor weather conditions our view was less than perfect, but nonetheless we could see the North Greenwich Arena and Canary Wharf, with the Gherkin and other City skyscrapers in the distance. The views on the approach to Royal Docks are mixed – you can see Excel London and the runway of City Airport, but the industrial parts of the docks (while arguably representative of “real” London) are not so attractive. Unless you have a serious fear of heights, a trip on the new Emirates Air Line is the kind of thing everyone should do at least once. 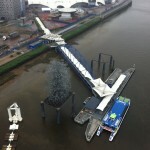 It’s an interesting new addition to the London skyline, is a great experience for children, and beats taking the bus any day! 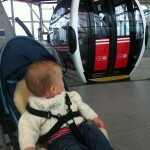 The cheapest way to take a single trip on the Emirates Air Line is with your TFL Oyster card/Travelcard: £3.20 for adults, £1.60 children. A single trip without an Oyster card costs £4.30 for adults, £2.20 for children. Frequent travellers can buy a bundle of ten single tickets for £16. 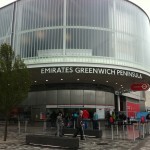 Departing from South of the River Thames: The nearest station to Greenwich Peninsula is North Greenwich (Jubilee Line). Departing from North of the River Thames: The nearest station to Royal Docks is Royal Victoria (DLR).